Originally released in 2016, Final Station is a side scrolling 2D shooter with survival-horror elements that now finds itself on the Nintendo Switch. At first glance this combination seems like it lacks direction, however, the game is structured in a way where is creates its dark sense of mystery in a compelling way. Gameplay is broken up into 2 sections: riding your train from zone to zone (train stops) and exploring zones for resources while saving civilians (as well as finding the code to open a blockade that allows your train to press forward). The train sections are quite simple when you actually get to experience them gameplay wise. The perspective remains the same and you essentially walk around your train performing a series of mini-games repairing the train. The goal of these train sections is to keep the people you’ve rescued at the various stops alive by feeding them and healing them. These sections honestly feel pointless and tacked on. If a person dies the repercussions are near meaningless and the mini-games are tedious at best. 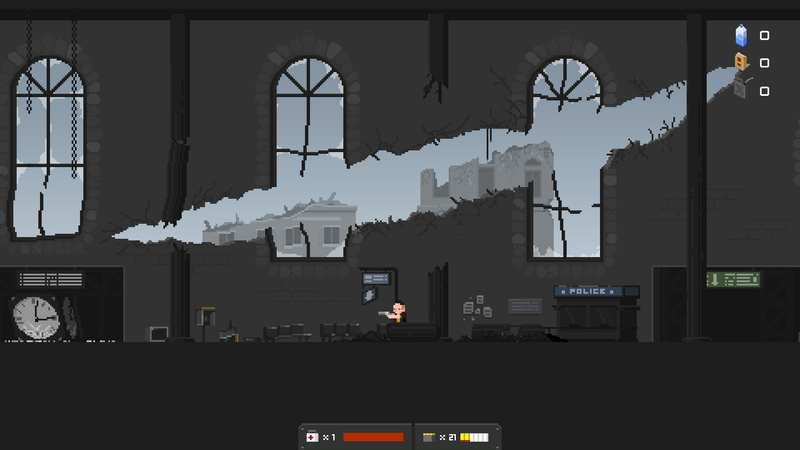 The main section of the game is when you get off your train to explore the train stop. Your main goal is to find the code, which will allow you to return to your train and continue on your way. While looking around the train stop you will encounter zombies of various types, ammo, and set scenarios where you will receive new weapons. This core gameplay is really fun. Killing zombies is satisfying and exploring the small sections of towns to scour for ammo and resources is genuinely challenging in a fun way that keeps you on your toes. A majority of the game is spent in these sections and they are definitely the best experience in the game. My only gripe with the combat is Nintendo Switch specific. The aiming controls are touchy with the right stick. If you let go of the right stick, your aim resets. In order to shoot at an angle you need to hold the right stick at that angle and press the right trigger. Every time I have to pull off this kind of shot, pulling the right trigger causes my right thumb to move slightly, making the shot miss. This is definitely an annoying situation especially in the Switch’s handheld mode. 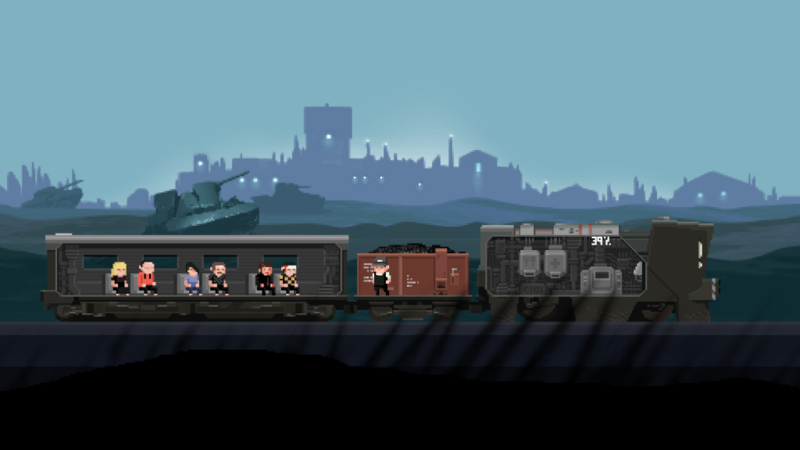 Final Station has some of the most gorgeous pixel art animations I’ve seen. I am an absolute sucker for pixel art and the style oozes out in Final Station. Everything from the reloading and healing animations, the ruined city environments, and even the backgrounds that parallax as you ride the train are beautiful examples of a development team putting massive amounts of effort into the product. The story is told through short conversations with NPCs, conversations between rescued NPCs on your train, hidden notes throughout the environment, and a messaging system you can interact with. Without ruining it, I will say the story is enough to keep you playing as you feel like you’re slowly uncovering the history and motives of this world and the characters within them. Final Station has no music during gameplay. A strange choice, but it ultimately fits the atmosphere, while exploring the ruined city environments. The sound design is top notch. Gun shots are satisfying, zombie noises are unsettling, and the trains sound like trains, what more can you ask for? Final Station is perfect for the Nintendo Switch. What pixel game hasn’t been? Being broken up into short sections makes it an excellent handheld game to play on the go. I found myself continuing to play just to see what gorgeous pixel art the game had up it’s sleeve. The game’s core gameplay of exploring cities and shooting zombies is very satisfying as you uncover the mysteries of the world the game portrays. Aside from a disappointing train section that makes sense thematically but not mechanically, Final Station is definitely a Nintendo Switch game to pick up. Switch version reviewed. Final Station also available on PC, PS4, and Xbox One.